Hello friends! The weather finally decided to cooperate with me so that I could get some painting done. Today I bring you the red bed. I had quite the time with the red spray paint. In fact, it was almost a disaster. But before I get into that let me show you the before picture. 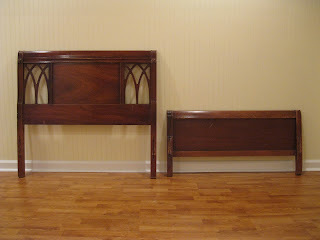 This is a twin size bed, manufactured by Dixie Furniture, and purchased by yours truly at the local Goodwill for $19.91. While it looks decent in the picture, it was in pretty bad shape with lots of dings and scratches on it--especially on the footboard. Unlike my previous spray paint adventures, this time I decided to choose my bedding first and then choose my spray paint. 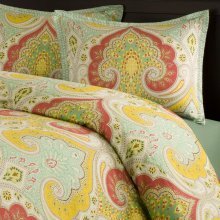 I chose the Echo Jaipur comforter set. Since the room itself is a pale yellow I decided to focus on the red. It was tough finding the right shade of red. Most were too bright, some were too pink. I even took the fabric to a big box store and asked them if they could match the red. (Apparently you can't pull colors off of fabric, although that's not what the advertisements say.) I eventually ended up finding Krylon Tomato gloss spray paint at Home Depot. I purchased two cans thinking it would surely be enough to do a twin size bed. Wrong! I don't know if it was the Kryon paint or the red color but this spray paint had awful coverage. It took a whole can just to do the footboard. Also, apparently red shows up every little scratch and ding so I had to resand the footboard after the first round of spray painting. I knew the one can I had left wouldn't do the job so back to Home Depot I went. Much to my chagrin in the two weeks since I had last been there they had stopped carrying Krylon!! Just my luck. I went to Hobby Lobby, Joanne's, Michael's, KMart, Wal-Mart, Ace. They all had Krylon, but none of them carried this color. I called Sherwin Williams and they could order it for me but I had to purchase a case, which was 6 cans. I finally found it on Amazon but had to pay pretty outrageous shipping prices. In hindsight I would have actually been better off to get the case from Sherwin Williams and try to sell MY extra cans on Amazon. But I digress, the spray paint finally arrived, the weather cleared up, and I was able to return to the task at hand. I neglected to take a picture of the bed with the spray painting alone but just know that this red is pretty and bright. It's definitely not a color to use if you don't want to draw attention to something. I decided early on that I was going to glaze this piece because of all the nooks and crannies just begging to be showcased. I chose a black glaze, specifically Martha Stewart Metallic Glaze in Black Coffee. This glaze was so SIMPLE to use. I've used a paste type wax before and it wasn't nearly as easy as this. Be warned, it is quite messy. I had glaze all over my hands by the time I was finished. Luckily, it washes off easily with a little soap and water. Here is the after shot. And here are some close up shots of those wonderful details. I wish I could show you what the bed looks like with the comforter on it, but alas, I still have to buy a twin size mattress set. Update! I have finally bought the mattress and here is a picture of the completed bed. Joy! Thanks Robin! I would prefer to spray paint but at that point I was getting desperate. Luckily it all worked out! Wow! That turned out wonderfully! I'll bet it looks great with that bedding, too. that is just fabulous. I love the red. Thanks! It was actually my first time with a liquid type glaze. I'm hooked now. Once I use up the paste wax I have I'm never looking back! Thanks for being my follower, I'm now following you as well! I love the red, it looks fabulous! It's great! The darker glaze adds just the right touch! I FB it! I think the colur looks great, love the finish with the glaze and I think it's going to look amazing with that bed linen. What a great color-I'm your newest follower!! Thanks Claire! I'm now following you as well! I love the red bed. I think the glaze makes it look really professional and from a high end store. I am so impressed. I am your latest follower. I found you via Debbie's party. Hope you will stop by and become a friend. I love the color and have used that on some small projects. Red is tough on bigger pieces. The glaze was a perfect touch. Thanks for sharing with the newbie party. Beautiful color and the glaze just intensifies it! Wonderful transformation!! Congrats! You're a feature this week! This is exactly the right red! It was worth hunting down another can. It will look beautiful with new comforter. Beautiful job! Love, love, love the red! I have yet to take on the task of hunting down the right red. I have a wooden Ethan Allen bench I have toted around for years that needs a new look. Perhaps red will be it. Thanks for the inspiration. I'm your latest follower and a fellow newbie. Hope you'll stop by and visit me. I love red color! And I looked at this glaze, just tonight. Exactly how did you apply it? And I can't wait to see it with the bedding! Misti, I just brushed the glaze on with a paintbrush (I put it on pretty thick) and then waited 5-10 minutes and wiped off the excess with an old t-shirt. In the places where I felt like I wiped off too much I just applied some more. It was surprisingly easy. Good luck! This is just gorgeous! WHat a great find - for less than $20 and you've made it beautiful. Just love it! Fabulous!! 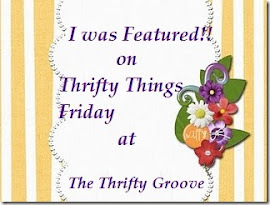 I just had to pin it and post your blog in a message to a friend on Facebook. She has a bed to redo and I think this would be the perfect inspiration for her. Great Job! Hi--I had saved this in my inspiration file & came across it today now that I am ready for a "perfect" red! This is just so beautiful & what an amazing transformation! 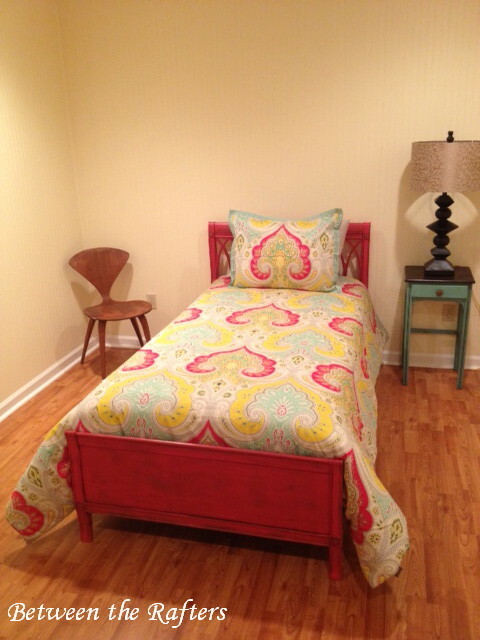 Love the completed look with bedding, too! And, what a cute little nightstand! Blessings!